Very Popular for Food Delivery Guys! Highest Capacity In The Industry 1250 Pounds! If you are looking for diversity, but only want to buy one hand truck – you are in luck as Handtrucks2go offers convertible hand trucks that are two and sometimes three hand trucks in one! 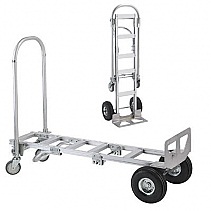 Many companies have a daily need for a two-wheeled hand truck and the occasional need for a four wheel hand truck for heavy loads. This gives you the ability to have the type you need when you need it and many are able to be folded for easy storage as well. 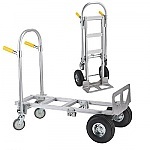 We offer high quality folding hand trucks with a wide variety of weight limits depending on what you are looking for. You will find lightweight hand trucks with a weight capacity of 110 pounds or up to 400 pounds for approximately $100 that might be ideal for small businesses or home use. 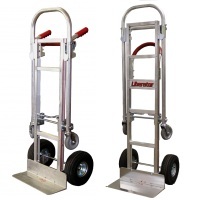 Larger companies, stores or warehouses might find the heavy duty convertible hand trucks that are battery powered and have weight capacities up to 1200 pounds more applicable to their business needs. 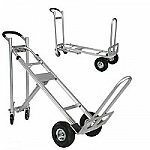 Whatever type of convertible hand truck is required, Handtrucks2go has experienced and knowledgeable staff to advise you on what you are looking for. All of them are high quality convertible and offered to you at a great low price. Not quite what you’re looking for? Click here to see all the types of quality hand trucks Handtrucks2go offers you! Handtrucks2go is your best choice for all your moving equipment needs.